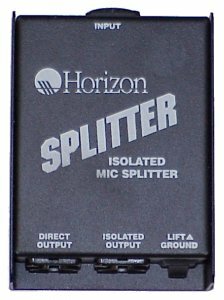 The MS-1 splitter box is the answer for anyone needing to split a Lo-Z microphone signal (or similar source) into two outputs. Uses include live recording, on-stage monitoring, press conferences, videotaping of lectures. 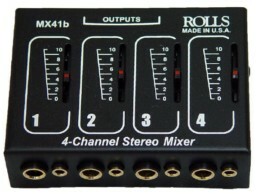 By using only the isolated output, it can work as an isolation transformer for long microphone lines feeding unbalanced inputs. Transformer isolation can help minimize interference from radio transmitters, lighting dimmers, and 60hz AC power wiring. 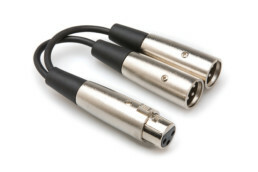 Hookup requires only standard XLR mic cables. 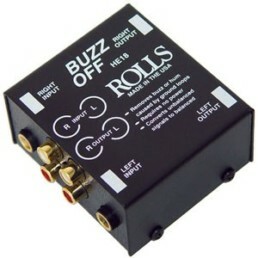 It has an input, a direct output (allows phantom power to pass), an isolated output to keep the outputs discreet from each other, a ground lift switch for buzz-free operation in almost any environment and a formed steel box. The connectors and switch are recessed to resist damage.